1991-1995, Bezalel Academy of Art and Design Jerusalem, Industrial Design department, B.Des. 2000-2003 Designer in Z.A.G. Industries, speciality in DIY plastic products. 1999-2000 Designer in FORM Design, electronical and ligth products. 1998 Establishing FAZA Design Atelier with Anton Zubatov. since 2004 -Present, lecturer in Bezalel Academy of Art & Design Jerusalem,Industrial Design department. 2005-2007 lecturer in H.I.T. Holon, Industrial Design department. 2003-2010 lecturer in Shenkar College, Visual Comunication Department. 2000-2008 lecturer in Kibutz Artists Workshop. 1998-2001 lecturer in Vital Tel-Aviv Design College. 2008 “Toys Collection” in “Vanishing Point”,Tel-Aviv, Israel. 2008 “The Mud” in “Vanishing Point”,Tel-Aviv, Israel. 2006 “Stiff Necked” Artists House, Tel-Aviv, Israel. 2005 “Basic Contrast” Periscop Design Gallery, Tel-Aviv, Israel. 2004 “FAZA+1” Studio FAZA Design Atelier, Tel-Aviv, Israel. 2007 “4 Design Groups” Hava Gallery, Holon, Israel. 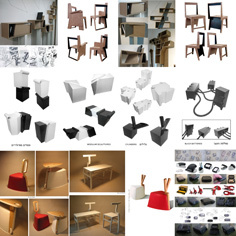 2006 “ReOriented Design", The Saint-Etienne 2006 International Design Biennial, France. 2005 Prizes for Art & Design from The Ministry of Education & Culture 2005 Exhibition, Tel-Aviv Museum. 2005 “Promisedesign” International Furniture Fair, Copenhagen, Denmark. 2005 “Promisedesign” Triennale museum, Milan, Italy. 2005 “Promisedesign” Designmai Festival, Berlin, Germany. 2004 “Life Symphony” in NYC USA -Felissimo Design House. 2004 "Design Matters”in NYC USA-Felissimo Design House. 2003 “Head Guard” Bezalel Gallery, Tel-Aviv. 2003 “About Design” Design Drawings, Bezalel Gallery, Tel-Aviv. 2002 “Industrious Designers 2” Abitare il Tempo, Verona, Italy. 2002 “Industrious Designers 2” Uměleckoprůmyslové Museum, Prague, Chech. 2002 “Industrious Designers 2” Messe Frankfurt, Frankfurt, Germany. 2001 “Industrious Designers” Abitare il Tempo, Verona, Italy. 2005 The Ministry of Education & Culture, Prize for Design 2005. 2004 The Ministry of Industry & Trade, Design Third Prize for Consumer Products. 1995 The American-Israeli Cultural Fond, Winner Scholarship.